If your club holds only two-meter ARDF events, you're missing half the fun. There's another international foxhunting band, too. Reprinted with updates from Homing In columns for November 2000 and October 2016. Before two-meter FM became popular in the late 1960's, clubs held their mobile hidden transmitter hunts (T-hunts) on the 80-meter (80m) and 10-meter bands. 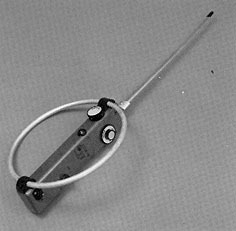 Look through ham radio magazines of the 1950's and you'll see a variety of radio direction finding (RDF) antennas sticking out of car windows, including big box-shaped loops and little ferrite rods. Transmitters and receivers used tubes back then, so "portable" really meant "big and heavy with a handle." Low-voltage dry cells were necessary to light tube filaments, and high voltage batteries powered the tube plates. That didn't stop the ham hiders of that era, who sometimes put their emitters in baby carriages and built them into fake fire hydrants, just like today. Skywave propagation makes eighty meters a crowded place after dark, so foxhunts on that band were daytime events. (At night, ten meters was preferred.) The winner was usually first vehicle to be spotted by the hider, so hand-held "sniffers" were unnecessary. Almost a half century later, hams on this continent are rediscovering the joys of shortwave-band RDF. That's because it's an important part of the international on-foot foxhunting scene. Today's solid-state technology makes it easier and much more fun. 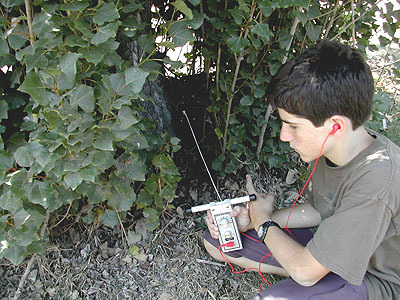 As regular Homing In readers know, competitive on-foot foxhunting (also called foxtailing, radio-orienteering and ARDF) follows rules that are promulgated by the International Amateur Radio Union (IARU). They originated in Denmark and England, where the sport began shortly after the second World War. Two meters was added later. Nowadays, IARU's national, regional, and world ARDF Championships expect all entrants to compete in an 80m event on one day and a 2m event on another. There are also sprint and foxoring events, both on eighty meters. In a few counties such as Sweden, 80 meters is still the primary band for ham radio transmitter hunts. A few years ago, I interviewed Per-Axel Nordwaeger SMØBGU, who put out courses for the 1994 ARDF World Championships near Stockholm. P-A dislikes the signal reflections that plague VHF hunts. "I don't find two meters as interesting because its so unpredictable," he says. "You end up in many places other than where the transmitter really is." Stockholm foxhunts are Wednesday evening at 7 PM in large wooded forests. In most months, that's well after sunset. Snow-covered courses are frequent. The hider puts out seven transmitters, timed to come on automatically and to transmit one after another in sequence. "Our old-fashioned receivers interfered with each other," says P-A. "So we had to spread the hunters out. They scatter into the forest two minutes before the first fox starts. They are allowed to continue to search for two minutes after the last transmitter shuts off, then return to the start. About an hour after the hunt ends, the foxes automatically start transmitting again to help the organizer find them to pick them up." 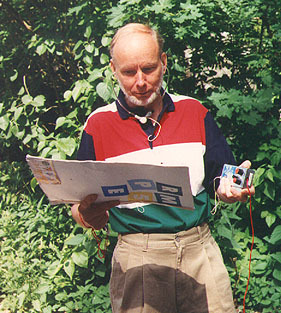 According to SMØBGU, most Swedish radio-orienteers use the same receiver design, which is about the size of a cigarette pack. "Two Swedes started building them around 1965," he says. "The circuit has been improved over the years. We can buy them either complete or in parts. The ferrite loop is quite OK. My friend Lars Nordgren SMØOY uses a larger air-core loop instead. It is heavier to carry, but gets a sharper bearing null." Per-Axel Nordwaeger SMØBGU is ready for the next Stockholm hunt in the forest. Note his cigarette-pack-sized receiver with rod and sense antennas. Stateside foxhunters know that 2-meter RDF is made more difficult by multipath. VHF signals reflect from buildings, hills and mountains. Bearings are most accurate when transmitters and receivers are line-of-sight and there are no large terrain features nearby. When you're in a canyon on the back side of a hill, 2-meter signals are weak, and bearings aren't trustworthy. Eighty meters is a different story. Groundwave is the primary propagation mode for fox signals on that band in daytime. Long metal structures such as power lines and fences can affect bearings if they are close to the receiver. But in general, bearings are sharper and more consistent than on VHF. Eighty-meter RDF equipment is smaller and lighter, too. That explains why winning times on 80m are sometimes 15 minutes better than for the same age/gender divisions on two meters in the ARDF World Championships. Ewald Stadler DJ2UE of Herrenberg, Germany is a foxhunt organizer and trainer for the Deutscher Amateur Radio Club. He says, "On 80 meters, you have to know your equipment, the null and front-to-back ratio. But mostly it's running, a sport competition. However on two meters, it's a brain competition. You have to be very careful what you do because of the signal reflections. On 80 meters you can stand still and navigate and take your bearing and then go, but on two meters, no way! If you stand still and take a bearing, you may be off by 30 degrees." ARDF promoters around the USA are adding 80 meters to their events. Starting in March 2000, almost all of our southern California multi-fox practice/demonstration sessions have had at least one 80m transmitter. Usually the hunters find the 2m foxes first, then start over again on eighty using borrowed gear. Most of them express amazement at the sharp bounce-free bearings on the new band. Sharp bearings and small lightweight RDF gear make 80m an ideal band for introducing youngsters, particularly pre-teens, to Amateur Radio and ARDF. Would this be a great activity for your next Scout campout or Jamboree-On-The-Air? Several manufacturers make "longwave-to-microwave" multi-mode hand-held receivers and scanners covering the 80m band. Available models include the Icom IC-R10 and IC-R20, Yaesu VR-500, Alinco DJ-X10T and AOR AR8200IIB. 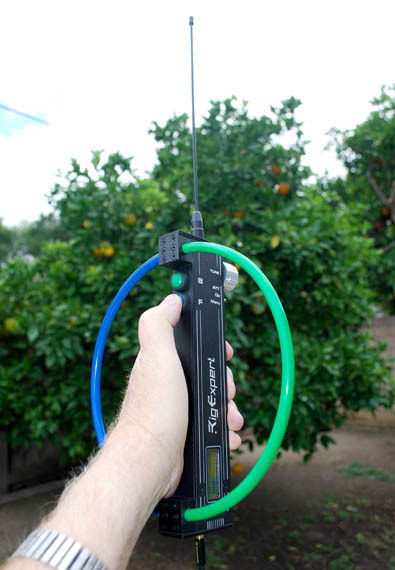 With such a set and an RDF antenna, you're ready for an 80-meter hunt. Be sure that the receiver has CW or SSB modes in addition to FM, because 80m foxes send keyed CW. 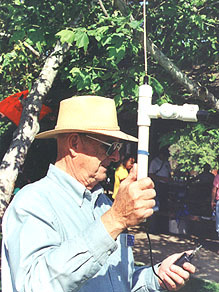 Bob Legg W6QYY built this 80-meter RDF antenna to use on foot with his MF/HF/VHF multi-mode hand-held scanner at a southern California hunt. On two meters, you can get a rough bearing by simply holding your handi-talkie or scanner close to your chest and turning around, listening for the signal null that indicates that the source is behind you. This "body shield" technique won't work with an 80m hand-held, because these long-wavelength signals pass right through our bodies with almost no attenuation. Reflectors or shields of metal won't make your 80m set reliably directional either. Attempts to shrink 80m yagis, quads and other high-gain antennas to portable size have proven futile. So loop and rod antennas are the best way to get good 80m bearings, just as they were a half-century ago. Large multi-turn box-frame loops are accurate and sensitive for mobile use (see Homing In for August 1991). However, they're too big and clumsy to carry on foot. Winding about the same amount of wire on a small ferrite rod makes for a light easy-to-carry antenna that has the same sharp nulls and almost the same sensitivity. Small air-core loops can also be effective if care is taken to achieve good electrical balance. Adding a vertical "sense" whip or wire with proper signal phase resolves the rod or loop's inherent 180-degree ambiguity. More about the theory and practice of HF loops, rods and sense circuits is in the ARRL Handbook and my book "Transmitter Hunting---Radio Direction Finding Simplified." Champion 80m ARDFers prefer integrated receiver/antenna sets. For over twenty years, the most popular 80m ARDF set for beginners has been the PJ-80 from China. Its three-transistor direct-conversion circuit is the essence of simplicity. Incoming signals from the resonant rod antenna are amplified by a bipolar transistor and go to a diode mixer. The local oscillator tunes 1750 to 1810 KHz to minimize 80m radiation. Output of the second harmonic mixer goes to a bipolar audio preamp and then to a LM386 audio output IC. 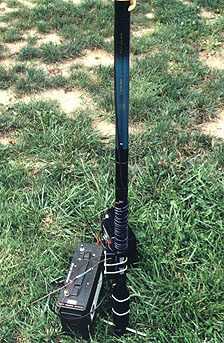 PJ-80s have been sold as kits or ready to use, powered by four AA batteries. Their biggest deficiency has been low audio output volume. For best results, search your parts drawer for high-output headphones. The best ones I have found so far are the earbids that came with my iPad. Opened for inspection, these two entry-level Chinese 80-meter ARDF sets have similar direct-conversion circuits. 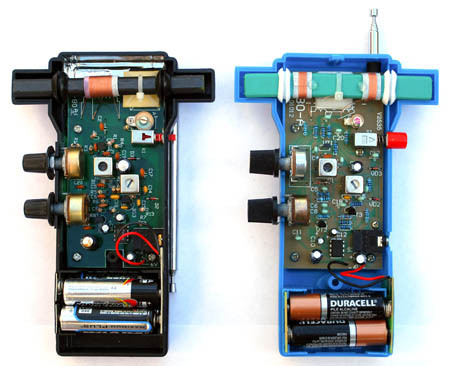 At left is the classic PJ-80 set with a single antenna winding and bipolar RF preamp. At right is the PJ-80A from Kazakhstan with split antenna winding and MOSFET RF preamp. No on-off switch is required because unplugging the headphones turns off the power. These sets are 6-1/4 inches tall and weigh less than ten ounces with the four AA batteries installed. Today there are several variations on this basic set including the PJ-80A kit from Kazakhstan, with a FET front end instead of bipolar, and the R3500D from Chinese Radio Kits in Shanghai and QRVTronics in Idaho. It has a TDA2822M IC in place of the LM386 in the audio output. This is a newer chip designed for low voltage operation in radios and music players, giving somewhat greater volume. At the 2015 USA ARDF Championships in Colorado, Shuya Zhen BD6NX arrived with boxes full of new 80m ARDF sets that are a step up in performance from the PJ-80 in a slightly smaller case. The RF80-C from the Zhengzhou Tianxun Radio Research Institute (CZTXARDF) features a superheterodyne receiver circuit with two SA602 ICs. Power comes from a pair of 3.6-volt rechargeable lithium-ion batteries in 14500 size, which have the same dimensions as ordinary AA alkaline cells. Unfortunately, there is no low-voltage shutoff circuit, so the user must take care to not let the lithium cells become fully discharged, as that will greatly shorten their life. I recommend replacing the supplied batteries with "protected" Li-Ion batteries. They have a built-in circuit board to disconnect the cell when it is nearly fully discharged. 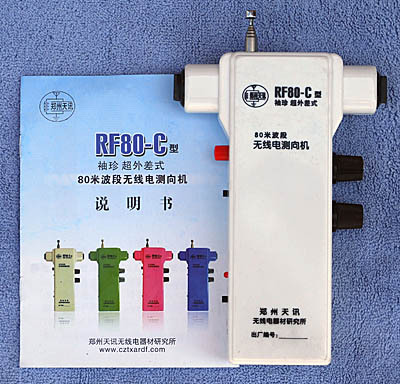 This Chinese RF-80C ARDF set for 80 meters with superheterodyne circuit costs approximately 75 US dollars at current exchange rates. The telescoping sense whip is extended in use. Pressing the red button switches in the whip to resolve the 180-degree directional ambiguity of the ferrite rod antenna. Altai ARDF sets from the Barnaul Radio Factory in southwestern Siberia are used throughout the former Soviet Union. That factory makes the "Altai-3.5" for eighty meters, which has a tunable receiver and loop/spike directional antenna system. The loop is about eight inches in diameter. Used Altai sets are often obtainable. Read some user reviews here. In Australia, Ron Graham Electronics provided an 80m ARDF set with rod antenna that looks very much like the Swedish set in SMØBGU's hand above. It is no longer available from Ron. A new superheterodyne set from Bryan Ackerly VK3YNG sold out quickly. The "Peilempfanger" by Siegfried Pomplun DL3BBX has been popular in Germany and the Netherlands. The project description (in German) is here. Also from Germany are some high-performance receiver designs by Nick Roethe DF1FO, including circuit board layouts for leaded and surface-mount components. Latest information (in English) is in this page by DF1FO. In Austria, the "ARDF80" receiver by Harry Gosch OE6GC is popular. There is now a new Version 6, which is described in Harry's site. In the Czech Republic, Jiri Marecek OK2BWN sells two compact receiver models. More information is at the OK2BWN Radio Sports Equipment English Web site. Several radio-orienteers in the USA have bought these "competition grade" sets and use them successfully. The Compact 3.5F 80m ARDF set from Czech Republic is sensitive and lightweight. Its small ferrite rod antenna is inside the ABS plastic case. OK2BWN also sells the high-end Superfox 3.5GX with synthesized receiver and larger ferrite rod with sturdy mount. There are some very good 80-meter set designs by stateside hams. Dale Hunt WB6BYU near Portland, Oregon developed a home-construction 80m ARDF set that was published in the September 2005 issue of QST Magazine. The antenna is a 6-inch diameter air-core loop. 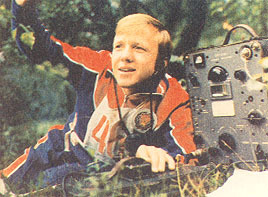 Various prototype versions of Dale's design have been used with success in the USA and IARU Region 2 ARDF Championships. Bare circuit boards for this project ("WB6BYU 80-meter DF Receiver") are available from FAR Circuits in Illinois. A kit of parts for the loop and sense antennas is offered by Marvin Johnston KE6HTS. Jerry Boyd WB8WFK of Albuquerque is author of "You Can Build the Albuquerque FoxFinder80" in the November 2000 issue of 73 Amateur Radio Today Magazine. 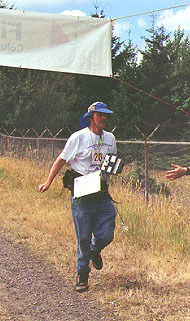 Jerry's prototype unit was used by a USA competitor at the 2000 ARDF World Championships in China. WB8WFK's Web site has updates on this project, including a PLL tuning modification. 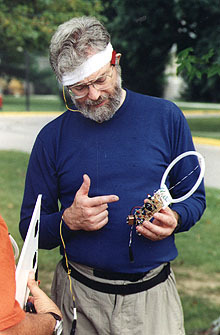 At left, Dale Hunt WB6BYU shows a prototype circuit board of his 80m ARDF receiver at the 2003 USA ARDF Championships in Ohio. At right, Jerry Boyd WB8WFK was the only competitor at the 1999 ARDF Championships in Portland who built his own 80m receiver/antenna set from scratch. He's crossing the finish line in this photo. The newest stateside design, used very successfully in recent USA and World championships, is by Vadim Afonkin KB1RLI of Massachusetts. It has a sturdy 8-1/2-inch loop and a high-selectivity superheterodyne receiver with low-drift local oscillator. Vadim offers fully assembled and tested units for $250 each. He also sells complete circuit boards at $150 each for those who want to provide their own case and antenna. Contact him by e-mail (vadim.afonkin@gmail.com) for details. Vadim Afonkin KB1RLI sells this simple but powerful 80m ARDF set that has won medals for himself and others at international radio-orienteering events. The buyer can choose dual banana jacks for Russian-style "clamp-on" headphones or a single 1/8-inch jack for regular earbuds. With the second option, a connector for charging an optional lithium battery can be included. Rig Expert Ukraine Ltd. is best known for antenna analyzers and data mode interfaces. Now the company is selling a production version of the FJRX85 receiver design of Nick Roethe DF1FO. The new FoxRex 3500 has a synthesized receiver with four preset memories, an audio S-meter and a transmitter timer. Depending on the setting of the attenuator control, the approximate distance to the transmitter is displayed. Separate attenuator and timer modes are included for classic, sprint and foxoring events. The set is now in stock at Rig Expert Canada. At this writing, it is not shown on the Canadian site, but you can contact Yuri Onipko N2WCQ/VE3DZ there to order it. The new FoxRex 3500 set from Rig Expert in Ukraine features a dual-color loop with two sense buttons. Pressing the blue button gives a near-cardioid response pattern with the maximum lobe in the blue direction, and the green button moves the peak response to the green direction. My reviews of the Vadim Afonkin and Rig Expert receivers are in the August 2017 issue of CQ Magazine. International rules for 80m classic ARDF competitions require transmitters to have 3 to 5 watts output, sending keyed CW (A1). Frequency range is at least 3500 to 3600 KHz. Rules for the sprint event call for two sets of transmitters and two beacons, spaced at least 30 KHz apart, so receivers for the sprint should cover 3500 to 3620 KHz. In the USA, a Technician class or higher license is required for the hider between 3525 KHz and 3600 KHz. An Amateur Extra class license is required for 3500 to 3525 and above 3600 KHz. There's no license requirement for the foxhunters, of course. The most popular 80m fox frequency is 3579.5 KHz, because inexpensive TV colorburst crystals on that frequency are still easy to find all over the world (even though analog TV is a thing of the past). 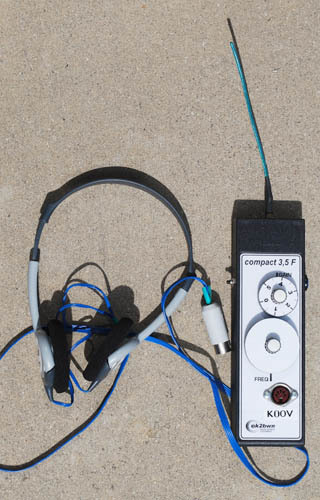 The finish line transmitter frequency should be at least 30 KHz away from the five fox transmitters to prevent QRM on simple receivers. 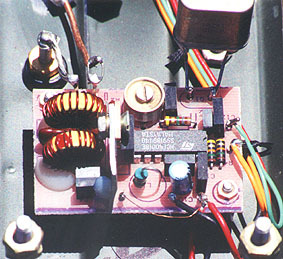 ATX80 transmitter by ON7YD, described in November 2000 issue of 73 Amateur Radio Today Magazine. Most QRP crystal-controlled CW transmitters can be pressed into service as 80m foxes. See my article "Super-simple 80-meter ARDF Transmitter" in the November 2000 issue of 73 Amateur Radio Today Magazine for details of an excellent design by Rik Strobbe ON7YD. More information on this transmitter is at Rik's Web site. Circuit boards for this project ("ATX80 transmitter") are available from FAR Circuits in Illinois. The Hardware Sources page of this Homing In site has a parts update for this project. TinyFox, a very low powered 80m ARDF transmitter for short hunts or for fox-oring is described in this Web site by Martin Kuhn, DL3SFB and Matthias Kuhlewein, DL3SDO. 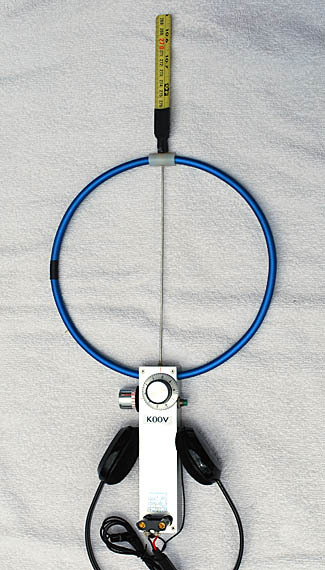 Fox transmitting antennas for 80m must use vertical polarization to provide best results with loops and rods. Such antennas can be simple if there are trees at the hunt site. I found that a more-or-less vertical wire 20 to 30 feet up into a tree and a single radial wire of the same length along the ground usually provide plenty of signal to the starting point without additional impedance matching, even on an IARU championship-size course, when used with the 3-watt ON7YD transmitter. How do you get the antenna up into the tree? And more important to a harried foxhunt organizer, how do you put five antennas into five trees in a short time? My answer: A slingshot. There are some new commercial slingshot/spinning-reel contraptions for sale to hams, but I have had excellent results with a simple twelve-dollar slingshot from the local sporting goods store. Rather than loft a leader line and then haul up the wire with it, I launch the radiating wire directly. For me, AWG24 stranded wire with multi-colored Teflon jacket is just right. I found white wire with brown, black and green stripes that camouflages well in leafy trees and on the grass. After one 80m hunt, I asked a hunter what he thought of my antennas. He said, "What antennas?" Tie a "3/8" size lead sinker (10 grams) to the far end of the wire, launch the sinker over a high branch, and the wire will follow. Be sure to secure the transmitter end of the wire so you don't loft the whole wire out of reach. The pile of wire on the ground must offer absolutely no resistance to being pulled up. Allow no tangles, and definitely no tree branches or other debris under the wire to snag it. Hold the slingshot upside-down, so that as the wire falls away after launch, it doesn't tangle in the yoke of the slingshot. Put tape over the eye of the sinker where it connects to the antenna wire. Before I started doing that, I got a nasty cut on my fingertip from the sharp point of the eye on one launch. NOTE: Use extreme caution with your slingshot. Wear safety glasses and watch out for others nearby. Check and obey local laws. The possession and use of slingshots may be regulated by city/county ordinances and park rules. The radial wire(s) can just be stretched out on the ground. I usually stick short skewers into the soil to hold the far ends of the radials in place and keep the wire from coiling up. In two locations at the June 2000 ARDF Team USA Qualifying Runs, the foxes were next to a creek, so I dropped the radials into it. Having only one radial results in a more covert hidden transmitter, but it reduces system efficiency and makes the radiation pattern somewhat directional. If possible, run the radial in the direction of the start point, to put maximum signal in that direction. Use care to minimize the hazard of tripping over it. More efficient transmitter antennas may be needed if transmit power is lower, receiver sensitivity is less, or if RF noise level is high at the site. For the 1999 IARU Region 2 ARDF Championships in Portland, Dale Hunt WB6BYU made antenna sets consisting of a 26-foot vertical wire, three 16-foot radials, and an RF matching transformer. His transformers were wound on Amidon T-130-2 cores, 5 turns on the primary (connecting via 50-ohm coax to the transmitter) and 55-turn secondary (to antenna and radials). I could tell that the matching networks made these antennas work very well, as I copied the foxes several miles away on my mobile rig. The need for tall trees limits the number of slingshot-friendly 80-meter foxhunting sites in southern California. Standalone 80-meter antennas can be made from 20-foot non-metallic telescoping crappie fishing poles holding up vertical wires, with loading coils at the bases. Text and above photos Copyright ©2000, 2005, 2016 Joseph D. Moell. All rights reserved. Photos by the author unless otherwise stated. Long non-metallic commercial fishing poles make excellent antenna wire supports for 80m ARDF transmitting. This one is at the 2003 USA ARDF Championships in Ohio. The transmitter and battery are in the weatherproof ammunition box.